One of my all time favourite stamp sets is Hero Arts "Stamp Your Own Salad" and today I've used it in a very CAS way. The beetroot, leaves and sentiment are all stamped using the set, and I've added a "ground" line using a deckle edged ruler. I made sure a tiny bit of the beetroot showed above the ground because that's how Mark's beetroot look when they are in the garden. The rectangles are cut using Gummiapan Stitched Rectangle dies. I die cut a little watering can to embellish it with but it looked all wrong, so that's gone into my bits box for on a future card. 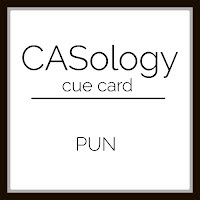 I have made this for CAS-ology where the cue word is PUN. Oh, what a fantastic love card. I don't care much for actual beets, but stamped beets are another thing. This is really clever, and I love your tilted panels. Thanks so much for playing along at CASology this week. A super card Jane, your beetroot looks fabulous and I love your fun sentiment. What a sweet pun card! Thanks for joining us at CASology! CAS perfection! Thanks for sharing with us at CASology this week! Wonderful pun card! So happy you could join in the fun at CASology this week.